It’s been years since I felt as strong as I used to. Ever since finishing my thru hike of the Pacific Crest Trail, I’d had bouts of extreme fatigue, deep muscle soreness, cold intolerance, mood swings, and hair loss. An assortment of seemingly random symptoms that would come and go, leaving me feeling confused and frustrated. Many of these symptoms have been present in my life for a long time, but after finishing the PCT, they became much more pronounced. I expected to finish feeling stronger than I’d ever been before. I’d jump right back into trail running and be at a new level of strength and endurance. Instead, I couldn’t run more than a few miles without feeling extreme exhaustion. I was depressed. I wasn’t having my cycle and I often felt sore for no reason. I’ve always been athletic and health conscious. I was doing everything I knew to do to be healthy. And I still felt horrible. After a few months of rest and experiencing only minimal improvement, I went to see a doctor. I had some blood work done, everything came back “normal”, and I was told that perhaps I needed to improve my diet, exercise more, and that essentially, it was just in my head. This was frustrating, as I was a health conscious vegetarian who exercised daily, and I knew my body well enough to know something was not right. At this point, it became clear I’d have to find my own answers. Due to a background in biochemistry and decades of reading health publications, I had a good foundation to start from. I read and listened to anything I could find having to do with adrenal and mitochondrial health. I sought out mentors, I interned under wellness practitioners, and I completed a Botanical Medicine Certification to understand what would truly support my body rather than cover up symptoms. I studied functional nutrition and began a certification to become a Holistic Nutritionist. I experimented with different diets, training protocols, and supplements. Symptoms would come and go. I was continuing to train for ultra marathons and my performance would come in waves. Sometimes I’d feel great and run for hours with no problem. Other times, I was weak, tired, and lacked the stamina needed for long runs. Despite the times when I didn’t feel well, I continued to push myself to run daily. I’d built an identity around being athletic, outdoorsy, and tough, and pushing through is what you did whether you felt like it or not. While this mentality has served me well in several endeavors, including long distance hiking, I was causing my body to be further depleted without even realizing it. Eventually, I found my way to a functional medicine practitioner who did an extensive intake, including a full thyroid panel. It was then that I discovered I had Hashimoto’s thyroiditis. Hashimoto’s is an autoimmune disease in which the body attacks it’s own thyroid gland. The thyroid gland produces thyroid hormones, which have wide-ranging functions in the body, including regulation of metabolism, growth and development, and temperature control. When I finally received the diagnosis, it was somewhat of a relief. I’d been struggling with an array of unexplained symptoms for quite some time. Despite all the research and self-experimentation I’d done, I still had no real answers up until this point. My reaction came in waves. At first, I was glad to have something to target. I knew my direction. I could make a plan. Next came the frustration of knowing that autoimmune conditions are hard to treat and something you manage for the rest of your life. 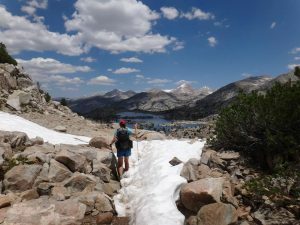 My identity as a long distance hiker and ultra runner was in peril. What if I never fully recovered? What if I had to give up long treks in the wilderness–the activity that filled my soul the most? And during all this time, I was in denial of the heaviness, the seriousness of what this meant for me. I thought I would remove trigger foods from my diet, take a break from training, and be back to 100% in no time, right? Not quite. I realized this is a pattern for me. I tend not to acknowledge the heaviness of an event or situation. I put blinders on and convince myself that everything will turn out fine. This lens of optimism and guaranteed triumph over hardship has served me well in life. I often push forward instead of letting fear get in my way. But it finally came crashing down on me that this tendency has also kept me from fully experiencing life and fully feeling my own struggle and that of my loved ones. Not fully feeling kept me from being as empathetic and present as is necessary to process and move through hardship. There are many factors that go into developing an autoimmune condition, including a genetic predisposition, a trigger (or several), and gut impermeability. It’s hard to know the trigger for sure, but for me, I believe it was a rattlesnake bite and brown recluse bite in the year before I hiked the PCT, coupled with the stress of the trail and a significant break-up that caused Hashimoto’s to surface for me. Autoimmune conditions are not an easy fix. You don’t take a pill and get cured. In the conventional medical model, those with Hashimoto’s take thyroid medications for the rest of their lives. These provide synthetic thyroid hormones to manage symptoms, but taking the medications don’t actually get to the root cause to stop the body’s immune attack on it’s own thyroid gland. I’ve always avoided pharmaceuticals when possible, opting to focus on the root cause of the problem and restoring the body to balance, rather than suppressing symptoms. My approach to Hashimoto’s is no different. I found experts who had put the condition into remission through changes in diet and lifestyle. The science and evidence was there to support this approach so I would try that before considering medications. It’s been about 6 months since learning about the condition and I’ve been on a protocol that supports my liver, adrenals, and gut health. While my symptoms have improved dramatically, I still struggle occasionally. However, I’ve learned an incredible amount about autoimmunity and health through my journey. I’m far enough on the path to have learned how to deal with the condition, what exacerbates symptoms, and what relieves them. I have high hopes for big adventures in 2018. I’ve felt so deeply the struggle of not being outside doing what I love because of how terrible I’ve felt. It motivates me to get well, learn as much as I can, and to guide others who get sustenance from being in the outdoors, but who struggle with their health. I’ll post more on the protocol I’ve followed and on my journey with Hashimoto’s in a future article, but if you have questions, please don’t hesitate to post a comment below or use the contact form to reach out. I read every response.